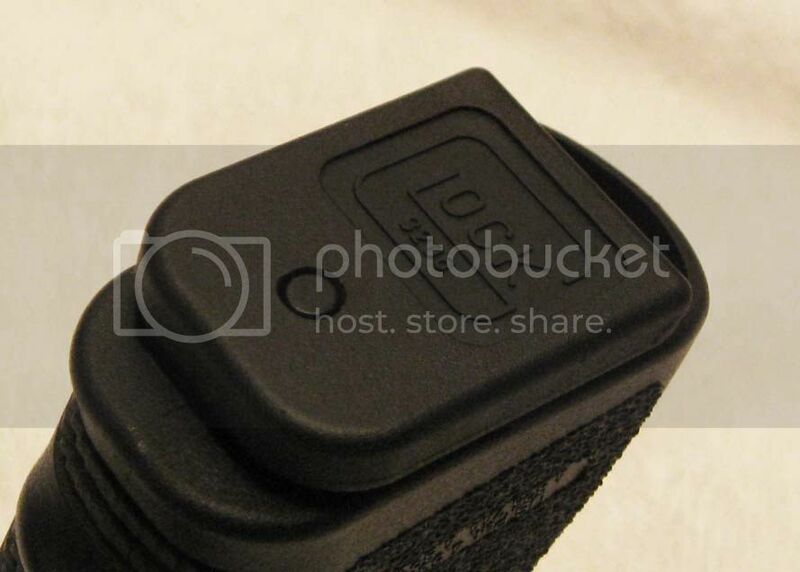 This won't be a super comprehensive review, but I wanted to post my initial impressions of the newest Glock 19 to the airsoft market. The gun comes in a plain jane brown box with some foam, a one page Instruction Manual / Parts Diagram (in english, surprisingly), the Glock itself, and a spare metal barrel. 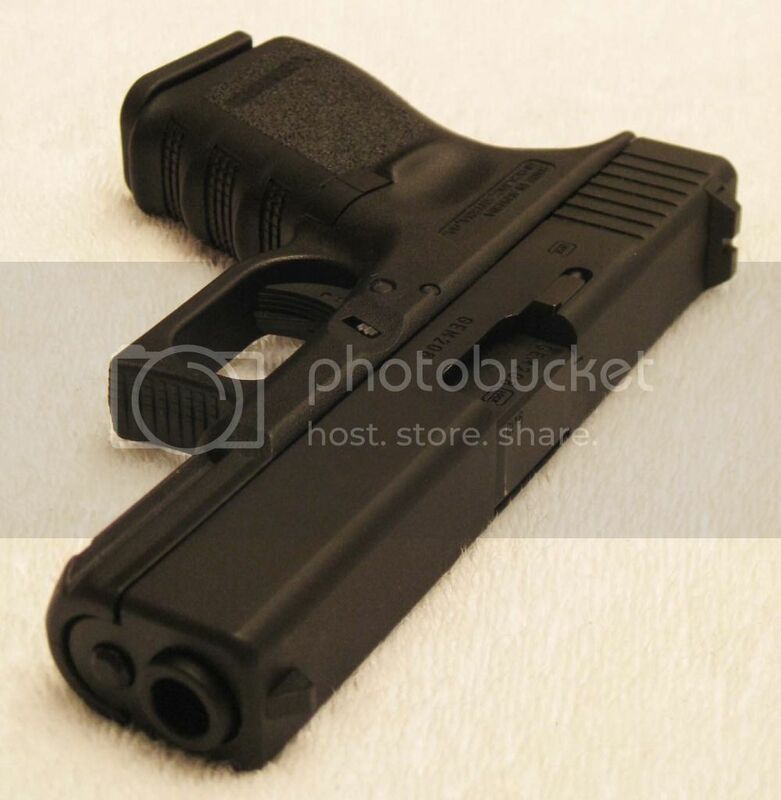 The gun comes shipped with a tradeless plastic outer barrel installed. I can post pictures of the box later if anyone's truly interested, but it's really not all that exciting to behold. I've owned quite a number of Airsoft Glocks throughout my addiction with this hobby. From KSC's (18's, 34's, 19's) and Tokyo Marui's (17's, 18's) running the gamut from bone stock to upgraded with things like Prime slides, Guarder frames, and so forth. I've handled after market slides from pretty much all the major manufacturers. All that said, I have to say this gun has (in my humble opinion) the most realistic finish in comparison to the real deal that I've ever come across. Now, I know what you're thinking, "Better than Prime?? Blashpemy!" Don't get me wrong, Prime slide's are amazing, and their attention to detail is great. But that's just it, the detail is SO good that it almost looks *too* good. I've shot and handled a variety of Glock firearms in real life, and while they were pretty nice to behold, none of them had that perfect CNC finish to them which Prime is known for. The slide on this gun isn't a 1:1 finish to the real one by any means, but it's close enough for plinking/collecting/skirmishing purposes. The same note goes for the frame too. I liked the frames on my KSC Glock 19's the best in comparison to stock TM and Guarder stuff, but now that I've handled this I can tell you I won't be going back to KSC anytime soon! So basically what I'm getting at is this: out of the box this is, hands down, the finest airsoft Glock I've ever had the fortune to handle. Your mileage may vary, but I base my opinion on my past experience with the other models I've owned. The biggest selling point for me was that this gun was at least partially TM based internally. I love the almost god-like durability of the KSC Glock 19's, but the hop up system and over all fit and finish of the guns (stock) always left a little something to be desired. The pin-system of the magazines , too, was always a bit of a pain in comparison to the screw-design of the TM mags when it came timet to perform basic maintenance on them. Thus far I can't confirm that the gun is 100% TM compatible, but things sure look that way. Comparing the parts diagrams side to side it looks like a lot of the major components such as the impact hammer, hop up, inner barrel, and hammer springs (trigger springs, etc.) *should* all be compatible. 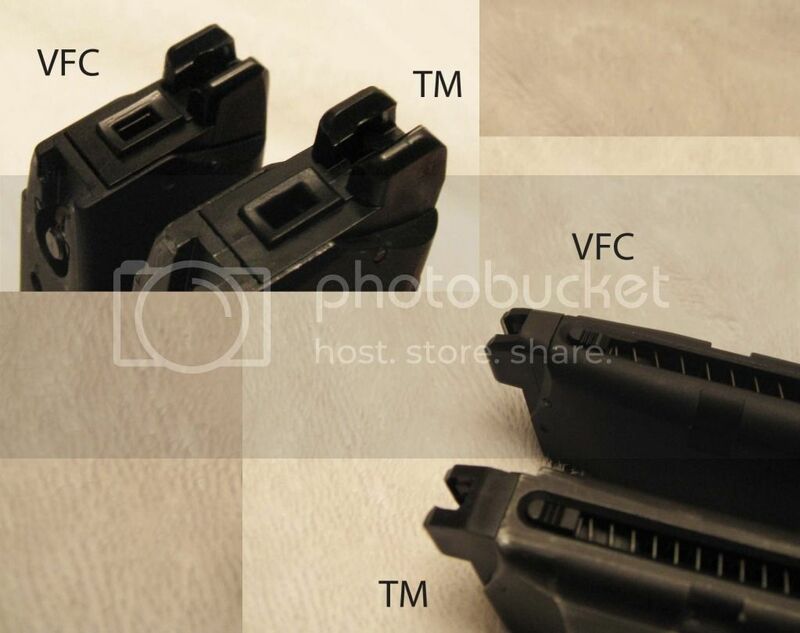 Looking at the internals it seems that VFC took Tokyo Marui G18 internals, and just put them into the 19's frame. I got this to use as a training pistol for Concealed-Carry shooting, so obviously I was concerned about it fitting into the holsters I planned to use. The biggest reason I typically kept KSC's over TM's is that the KSC would fit into my leather holsters without issue. As most of us know the TM Glocks, are slightly off-spec and can only fit in Glock-21 sized holsters. I didn't see the sense in using two-different sized holsters for training purposes so I stuck with the KSC system. I tried the gun out in a few of my Galco holsters, and much to my excitement it fit both perfectly. This bodes well for people who run Serpa's and the like. This gun fit into my Blackhawk with zero issues. 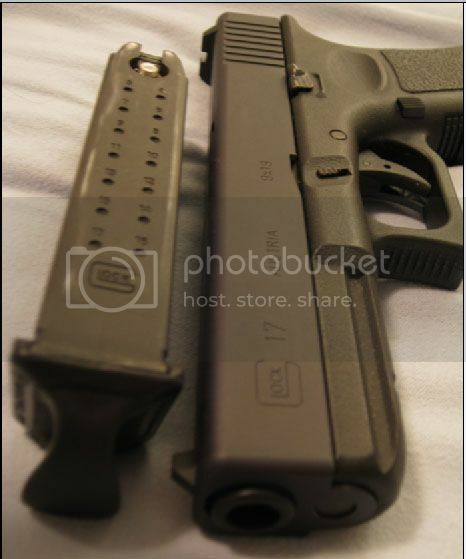 My second biggest concern was magazine compatibility Sure it looked like it had TM internals, but would TM mags fit? I can confirm beyond a shadow of a doubt that yes, they do indeed work. I will say that they're a wee-bit of a tight fit if you try to seat them with the slide forward though. To rectify this all you need to do is lock the slide to the rear and firmly seat the mag. Nice 'n' easy. -Out of the box the gun is stiff. And by that I mean racking it and such just feels a bit stiff. Nothing a little breaking in with some fresh lube and manually working the slide a fair few times doesn't fix though. -It is a tad lighter than the KSC G19 I just sold off, but it's not a huge enough difference that the average airsofter would cry over. 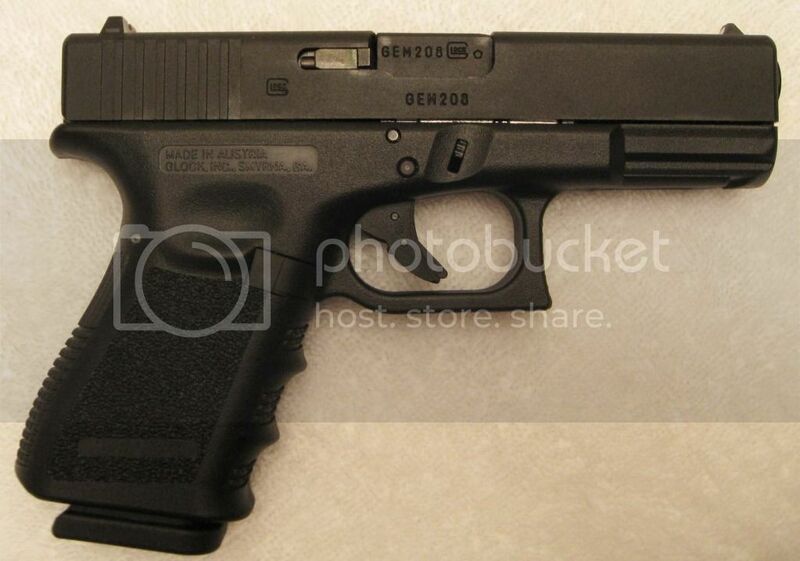 -The gun seems to use the same (or at least a similar) full-auto internal switch as the TM G18c. Time will tell, but so far this has proven to be really durable. I know there has been some concern over it wearing down over time. Honestly I don't see that happening. It also clicks very firmly from one position to another. WIth very little wobble or slack. -The magazine has cuts on both sides, so me thinks they'll be doing a Gen4 variant at some point. -Trigger spring is the heaviest I've experience on an airsoft glock so far. Suuuper crisp trigger pull. It's still got the same amount of creep as that which plagues all the other models, but the trigger pull is sublime in comparison IMO. -Recoil is extremely crisp and snappy. Definitely better than the KSC's I've had (even with metal slides), but it's been a while since I've fired a TM with a metal slide so I'll reserve judgement there. 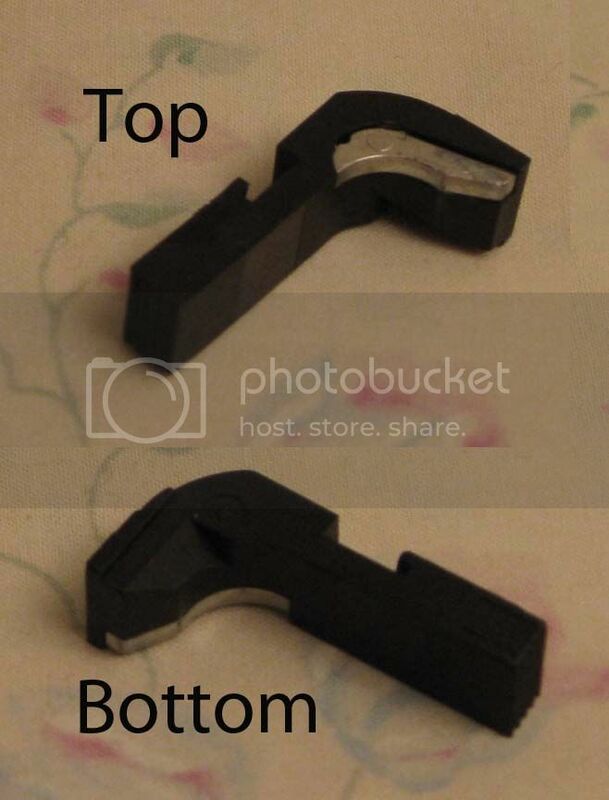 -The ejector on the slide is a separate piece. It does have some play if you mess with it, but it doesn't rattle audibly or anything. This was a *very* nice touch on their part. -The bearvertail/tang whatever you want to call it on this gun seems to be a few mm's longer than on the KSC/TM Glocks. This may not sound like much, but it makes handling this thing that much nicer since it locks into place a bit more firmly. All in all I must say I'm thoroughly pleased with this gun. It's got all the trademarks that the collectors will love, and (so far) all the performance the skirmishers will too. I've put about 15 mags through it so far, and at 20-30 feet without adjusting the hop up in the slightest this thing was shooting laser-straight. And that it's got the low profile option to switch to full auto was just icing on the cake to me. It's loads of fun to have this thing rocking back and forth in your hands emptying a mag. And AFAIK the non-black internal parts actually match the RS Glock internals so that's a cool feature. Dang, maybe VFC/Stark is the new favorite... Looks guud. Just a question of how long they can roam free with these traded models before someone cracks the whip. Because let's be honest, if it was blank or WE style trades it wouldn't be as attractive. 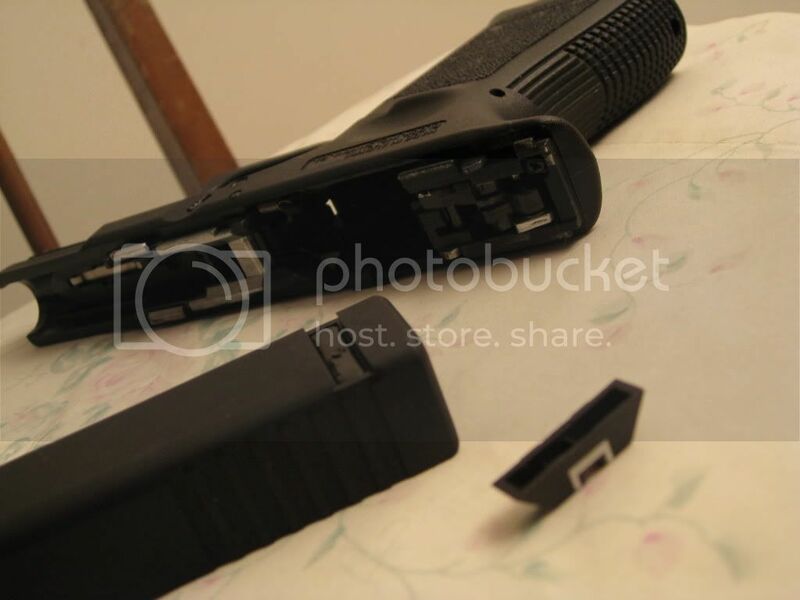 Is it just me or is that native VFC Glock 19 magazine sticking out just a taaad too much, like 1mm too much... Looks like it's hanging on for dear life on the mag catch. 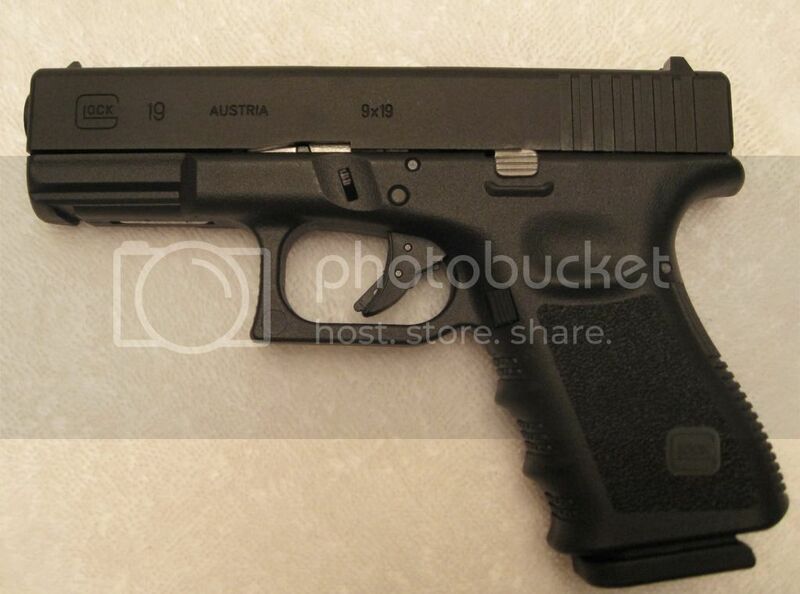 @ Clover, how is the overall comparrison to the G19 that you sold on GGi? From the looks of the picture alone, these VFCs (prticularly this one) owns the KSC hands down even if upgraded. *fruitcage* ing A, kicking myself in the ar$e. Worth noting as well is that the recoil-guide rod also sticks out on the VFC as well. 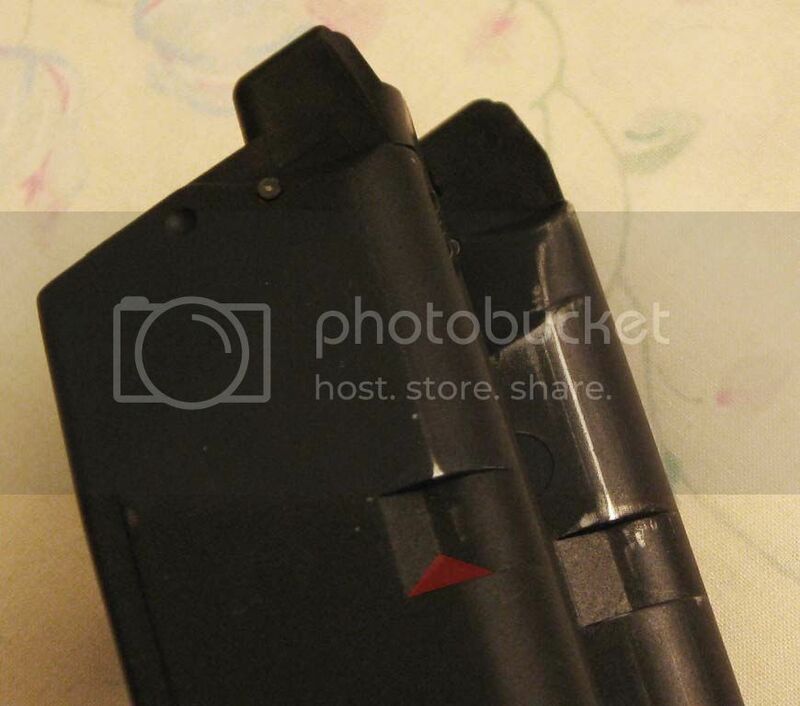 If you look at the above pictures you'll notice that the guide rod and barrel both potrude a bit from the slide. On most airsoft Glocks I've seen the guide-rod is almost always flush with the slide, which takes away from the looks a bit. Sticks out a bit, but not quite as much as the VFC. @rvlyssup: In my opinion it's much nicer over all than the KSC. Time will tell if it'll be as reliable, but it's already more acurate (shooting-wise) and feels SO much nicer in the hand. The frame on this gun is scores better than the KSC IMO. Any info in where to get one of these?? The WGC ones might be plain without markings, but they might also have photoshopped out the trademarks so they don't get in trouble. I've seen Redwolf do similar photo-editing in the past. I would email WGC and ask them about it. Who knows, they might have the traded versions for sale but legally can't display them as such. Thanks Clover; again, a very nice pistol. On the WE/HK3s, the recoil guide rod sticks out as well. Probably because I have changed out all of mine for mostly stainless steel SD & one steel Guarder RR set. The stock/OEM ones are a lot more flush as the chamfered end on the upgraded RRs are more pronounced. Just a note in case it bother people; I personally prefer the upgrade sets. Terrific review my friend! Looks like one hell of a nice piece. Oh, and good thing someone fixed you up with a TM mag to try out in it! Are there any light striking issues you have encountered? No disrespect taken That was a very well done review on his part. Glad I'm not the only one who feels this is one of THE best Airsoft Glock replicas around. The only thing I'll mention is the base-plate isn't as difficult to take off as you might have gathered from that vid. It is pretty secure on there, but there's actually a little "step" on the plunger piece that allows you to pull it down pretty easily. So you don't need a punch to get the baseplate off at all. @dazdarren: I haven't experienced any light striking issues myself, no. I've thoroughly checked the rest of the inside of the frame and there isn't a single wear-mark due to scraping or anything like that. 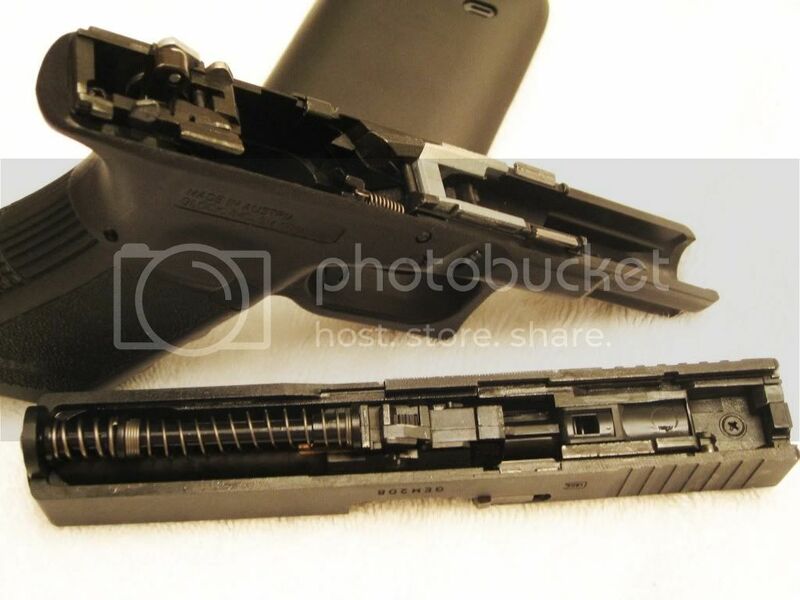 That's a shame to hear about the poor molding on the mag catch and selector switch on you Stark G18. Maybe it was one of their first runs? As to the plastic guide rod, I don't see that as a major concern, personally. It's polymer on the real deal as well, and I've yet to see a plastic airsoft one fail either for that matter. Not saying that it's impossible for one to break, just that personally I haven't experienced this on a TM/KJW/KSC. Talking to their reps last year, they completely redid their process after the G18C series they previously made. I was never impressed by the Stark G18's, and I was very skeptical when I heard they were going to do the G17 and G19, especially after the fiasco that is/was their M4 GBBR and MP5 GBB series. That said, when I saw their Stark/VFC G17 samples, it was pretty obvious they learned a lot from their previous endeavors. The guns I tested shot straighter and more accurately than the TM's I have (and obviously blew away my KSC and WE G17's). And the overall quality of the guns were better. And that was almost a year ago. It looks like these production guns are improved even more since those early samples which is great to know they took their time to do it right. I just wish they could have figured out a way to make it so that these guns would accept RS rear sights. But at least they hit everything else out of the park. I'm looking forward to getting their M&Ps. I just wish they could have figured out a way to make it so that these guns would accept RS rear sights. But at least they hit everything else out of the park. So happy I could kiss VFC right now. 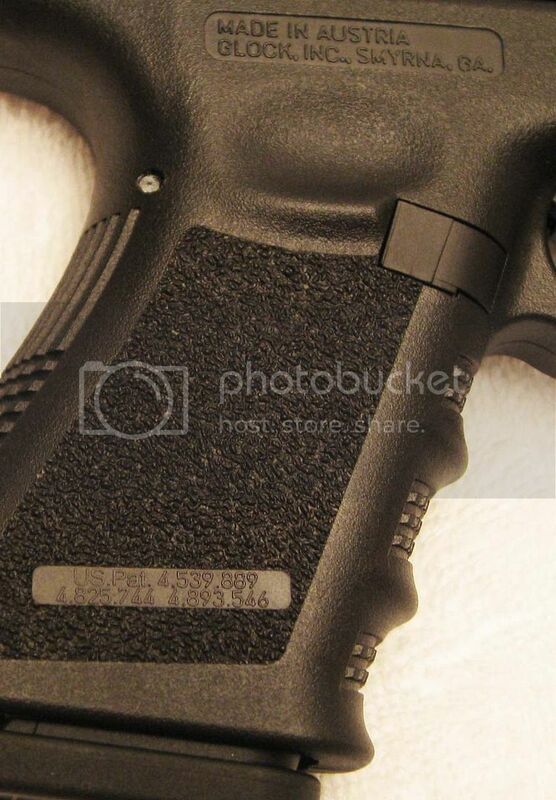 Looking at Stark-Arms facebook page it also appears that you can use real Glock slide plates too (the little plate on the rear of the slide). Wut. They actually listened to me? So can you confirm that the rear sight doesn't need to be installed in order for the gun to function? My concern would be that any RS sight would still have to be tapped and screwed into (which isn't the end of the world, just sayin'). Yep! Just fired off a round without the sight to be sure. That little plate you saw running across the space is separate from the blowback unit housing and is threaded to accept the BBU screw. 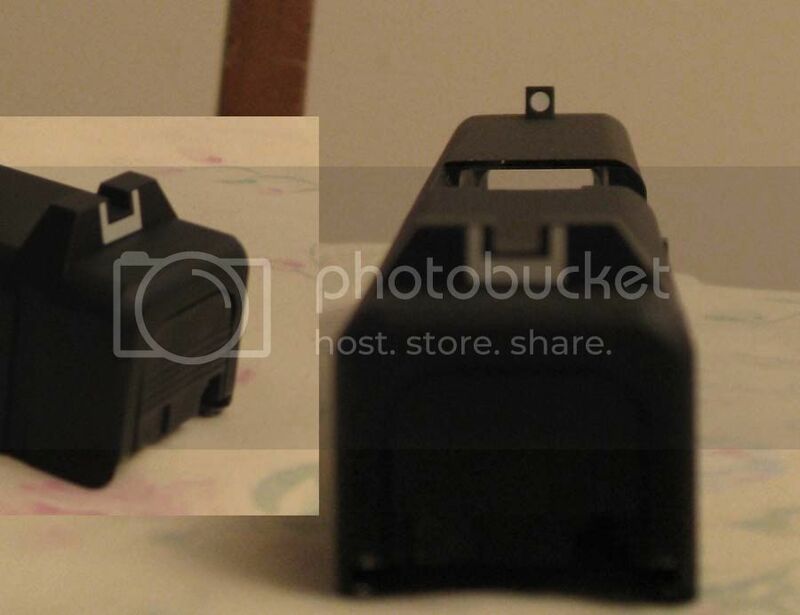 If you look closely at the rear sight too you can see that it's hollow. Said plate also sits flush with the slide so it won't interfere with adding aftermarket sights (I assume). If this thing can accept real deal mag-releases and slide stops I'll be completely sold. I despise the standard length of the stock mag catch so I've always swapped them out on the KSC's. This pistol seems too good to be true.... They need to up the production runs of these things so every human being in existance can own one ! 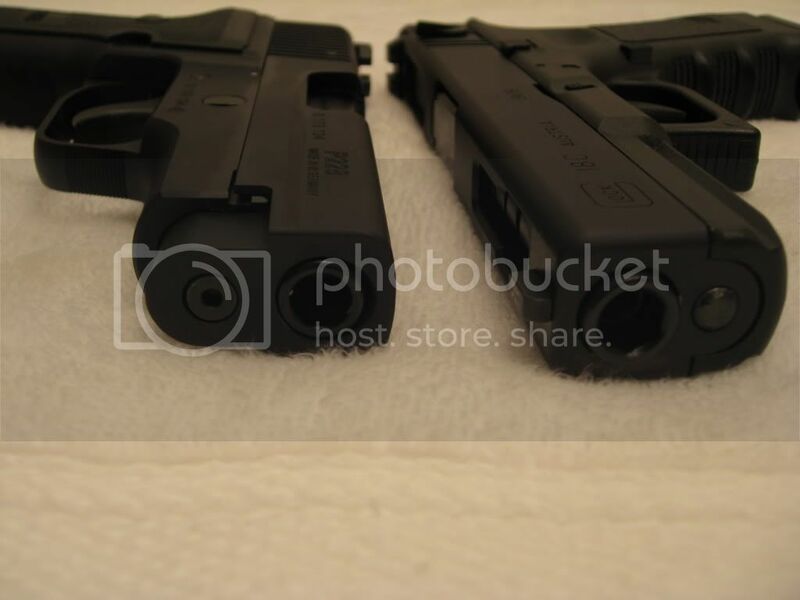 Never liked the esthetics of Glock pistols but damn, I have to admit they look tempting. A big thanks to -Clover- for taking the time to write the review, very much appreciated. 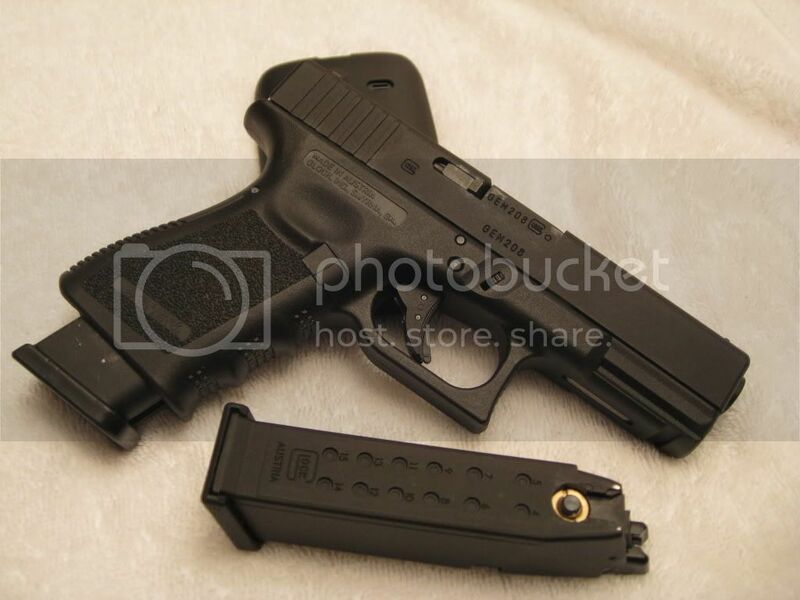 I have been thinking about getting another Glock for a while now, and this looks like it could be the best of the bunch, with the metal slide and sweet trades. Time will tell with reliability, but so far so good. Regarding external dimensions, how accurate do you think they are? Do you think this would fit with a Crye Gunclip?